We get asked all the time. “What should I wear for snowmobiling?” We hope the below information will provide the answers. Layers provide extra protection from the elements but also allows you to change for varying weather conditions. 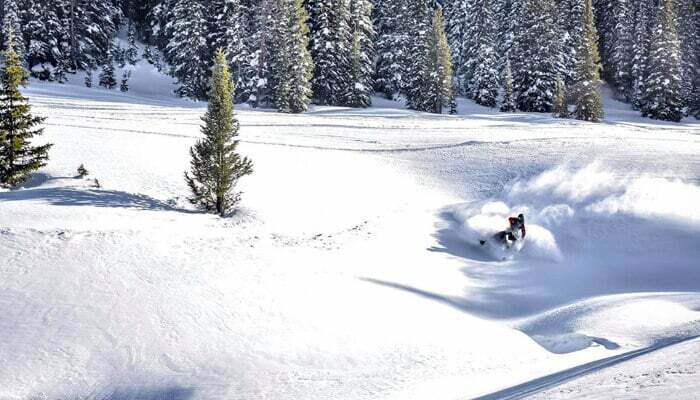 Though similar to what you wear while skiing, you should pack for extra warmth as the wind chill factors from your moving snowmobile require a little more protection. The number one rule when it comes to layers is to avoid cotton materials. Cotton only absorbs moisture which can later freeze. You want a good moisture wicking material such as fleece, wool, polyester, or a synthetic-blend. Your first layer needs to be polyester or synthentic. A long underwear top and bottom or a “onsie” is what you’re after. After the onsie, a good midlayer and an inner top layer are your goto’s. Your outer layers can consist of your ski jacket and ski pants. You’re going for heavy waterproof and windproof material. 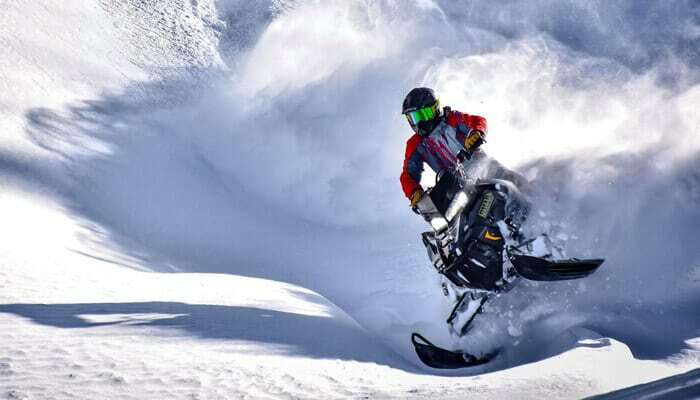 An in ideal world, you would have a specific snowmobile suit from companies such as Klim or FXRracing. We currently offer FXR products for rent in the shop. At Rocky Mountain Adventure Rentals, we think brains are important. It’s why we include Helmets from AFX with every rental. Not only can a helmet protect your head, it also helps to keep you warm. You want your helmet to fit snug and you want the strap tight but not to the point of feeling choked. If you do take a crash and hit the helmet, much like a bike helmet, you need to replace it. Helmets are designed to take one hit and after that, they need to be replaced as their structural integrity can no longer be guaranteed. Most helmets do include face shields but if you are using an open face helmet, you are going to want/need goggles. Yes, the same ones you wear skiing or snowboarding. 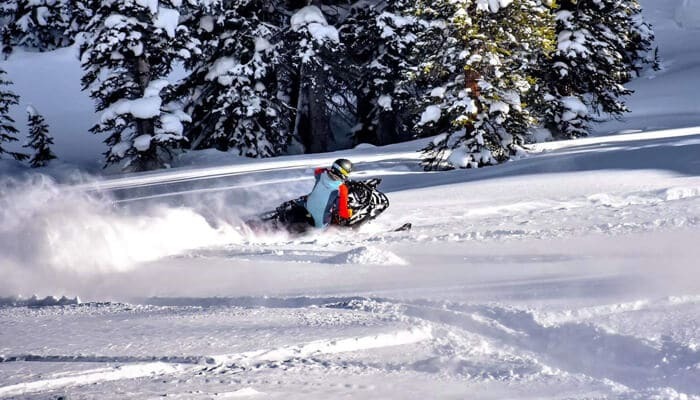 Aside from also helping to keep your face warm, the goggles protect your eyes from UV light and from the occasional branch that you may ride through or from chunks of snow and ice kicking up from the sled. Depending on the lighting, you may also want to have a few lens options for your goggles. Use the dark for high visibility days, Yellow for fog or low light, and you can use a rose/amber lens as a universal choice. For added facial warmth, you may want to look into a full synthetic facemask as well. They are usually a good item to carry in your bag for when you’re riding back to the trailer later in the evening. Waterproof and windproof gloves are essential. You’re looking for Wool Liners or Fleece. Mittens are always warmer than gloves but you will not have as good control on the throttle. Some gloves offer removable liners which are great for when the temperature rises during the day. Stick with your nylon, polypropylene, fleece, wool, silk, or synthetic blends. You should always bring an extra pair of socks with you. If your feet begin to feel cold, it’s time to change your socks. Again, waterproof and windproof is essential. You should also consider wearing pant gators if your boots/pants do not come with. Most boots are made from rubber and leather with a hefty lug sole for traction. For you skiers out there, your snowmobiling boot is not meant to fit as tight as your ski boot. You’re looking for comfort and warmth.